Several people had asked for good recommendations around the Big Island, so I thought I’d jot down some of our good (and not as good) experiences for those who are planning or at least dreaming of their own trip. My references included: Lonely Planet: Hawai’i the Big Island (3rd edition September 2008), my friend Fran (a native of Hilo), our previous trip in 2005, the interwebs, and recommendations from my followers on Twitter. Day 0: Flying into Kona (Kailua-Kona) on a drizzly Tuesday night is not ideal, but who am I to argue with $10 airfare from Denver to Kona? Thank you, frequent flier miles! December-January is considered the peak travel time and that can affect prices for lodging and other services. 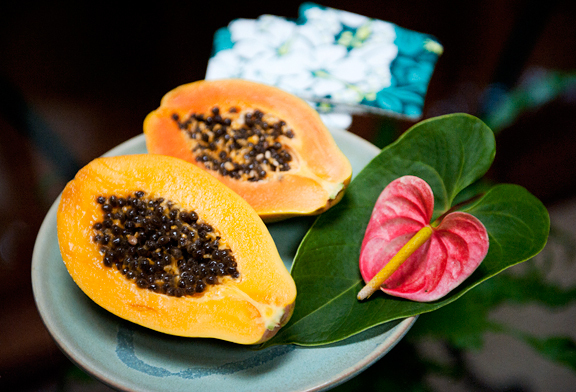 We popped into a KTA grocery store to ogle the offerings (lots of Asian stuff, regular white grocery stuff, and beautiful local fruits) and had a stay at the Royal Kona Resort. Jeremy found that one online ($123 for room with 2 double beds, $10/night for parking). Dated, but clean with pretty grounds. Apple bananas: They look like half-sized regular bananas, but they have a slight tartness to them which makes them infinitely better than the regular banana. You do need to wait for them to turn yellow as with regular bananas. 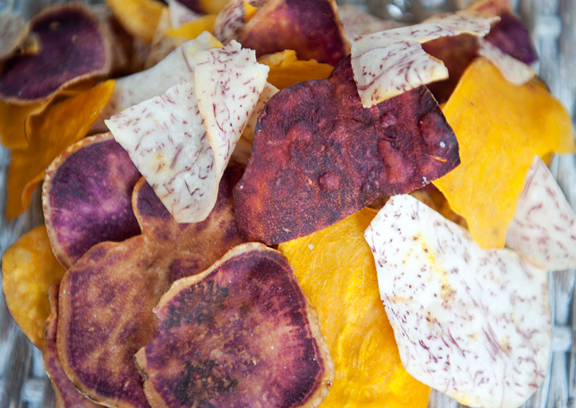 Taro chips: Taro is ubiquitous in Hawai’i. I love it. I’m Chinese, man. Looking at the label on one brand of taro chips, I was mortified to see that it had been processed on the mainland and shipped to Hawai’i, so we stuck with the local brands of sweet potato and taro chips. Day 1: We went to the green sand beach at Mahana Bay (free), one of three green sand beaches in the world – the other two in Guam and the Galapagos. 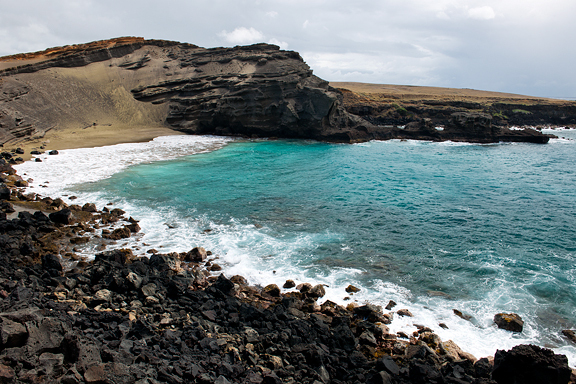 Hike 2.5 miles from the “parking area” to the green sand beach with mild yo-yoing as you skirt the coast. Follow the maze of 4WD roads that mar the coastal landscape (it can be quite muddy). The south part of the island is generally windy and sand was flying everywhere (not the green kind – that’s heavier). There were a few fellows with 4WD trucks driving people to the green sand beach, presumably for a fee. If you can walk, I suggest you walk and bring some water. 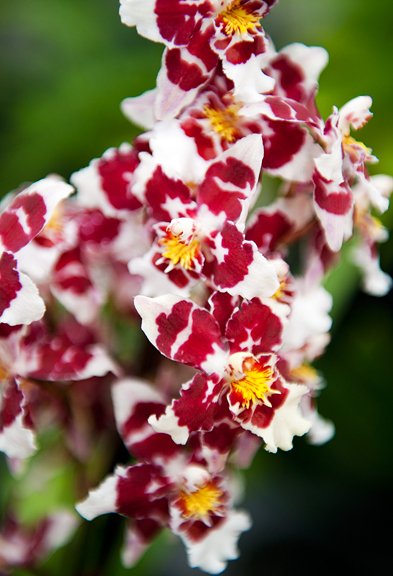 You will see plants, minerals, critters, and beach up close. It’s a quick and not so difficult scramble down the wall of the old cinder cone to the beach itself and worth the small effort. 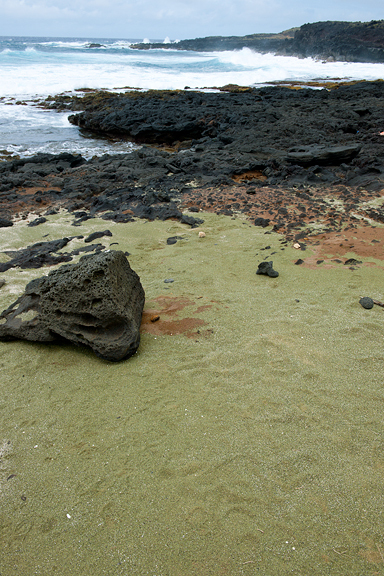 Removal of green sand is illegal, not to mention a jerk thing to do. On Highway 11 to the east was the little town of Naalehu. 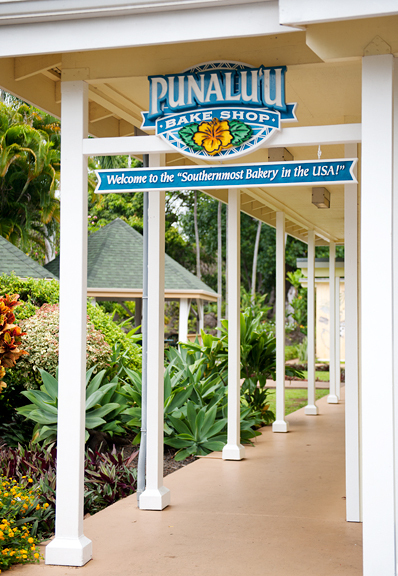 The point of interest: Punalu’u Bake Shop. 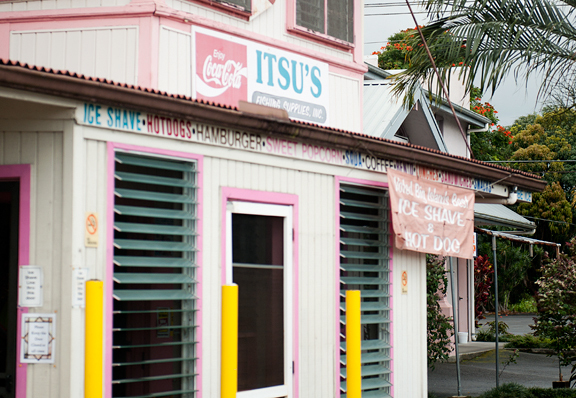 Their guava, taro, and other sweet breads are carried in most of the grocery stores on the island. We tried some of the samples before having lunch and malasadas. 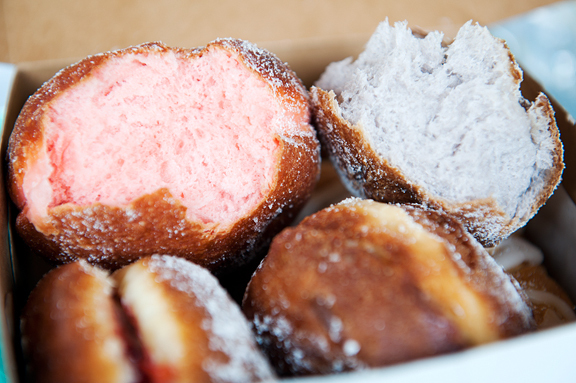 The chocolate cream and the strawberry-filled malasadas were nice, but the real winner for us was the plain taro malasada (we also got a guava, but I’m partial to taro and purple). It was raining, but there were several covered seating areas to enjoy your goodies while admiring native flowering plants in the gardens and all of the gorgeous local birds twittering about. We walked a little bit of our lunch off checking out the grounds (it’s small, but pleasant). 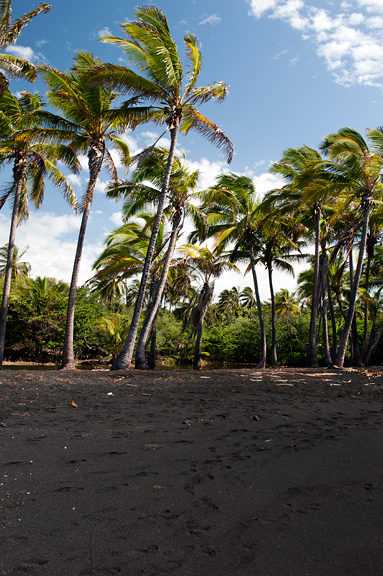 We made a quick stop at the Punalu’u black sand beach (free). It’s a pretty black sand beach, but I wasn’t there for the sand (which is a little uncomfortable to walk on because it is broken down from cooled lava – basalt – that hasn’t broken down completely into smooth little sand grains). 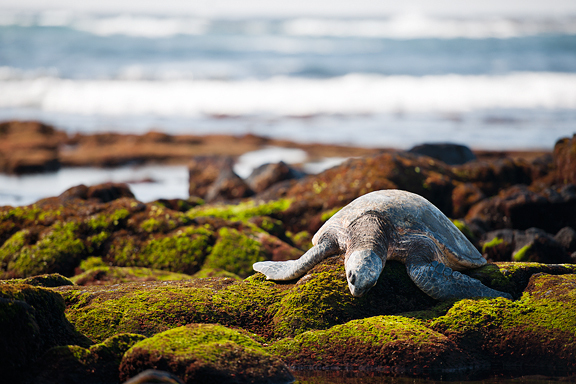 This is a great location to see green sea turtles, except we didn’t see many of them on the beach – mostly just frolicking in the water. It was afternoon and the winds were crazy, so we didn’t stay long. 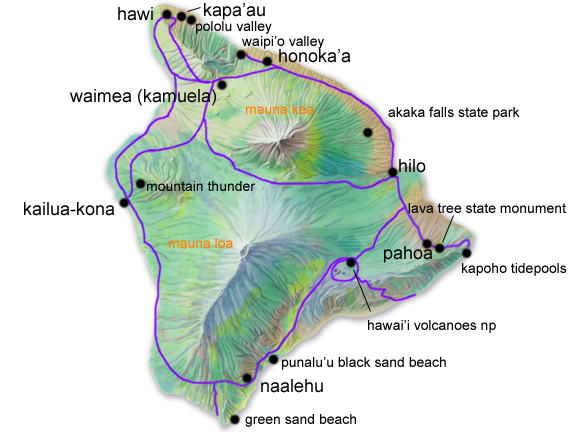 The drive from Punalu’u to Hawai’i Volcanoes National Park ($10/vehicle, good for 7 days) climbs 3500 feet. At some point you cross over to the wet side of the island. 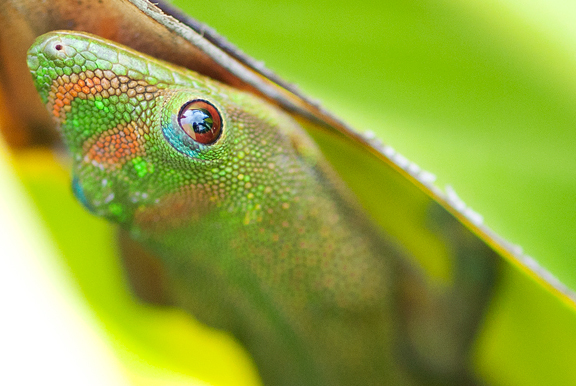 There are rainforests here for a reason. 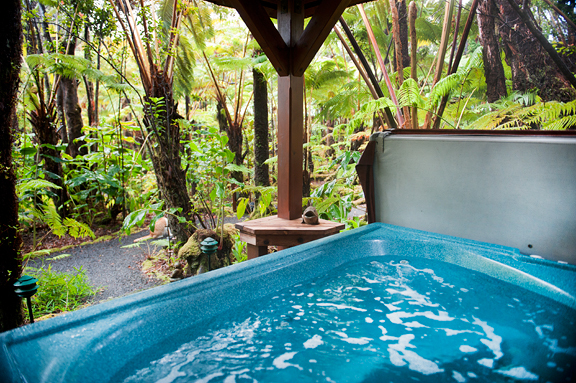 On the recommendation of a Twitter follower, I booked two nights for us at the Volcano Rainforest Retreat nestled in the rainforest just outside of the national park. 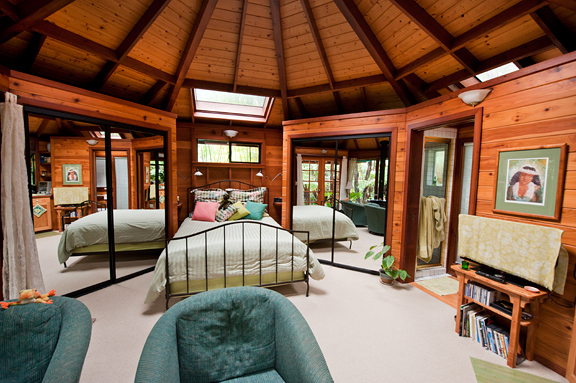 We stayed in the Forest House (for 2 night stay, $170/night not including taxes/fees) – an octagonal stand-alone structure with private path to the hot tub. 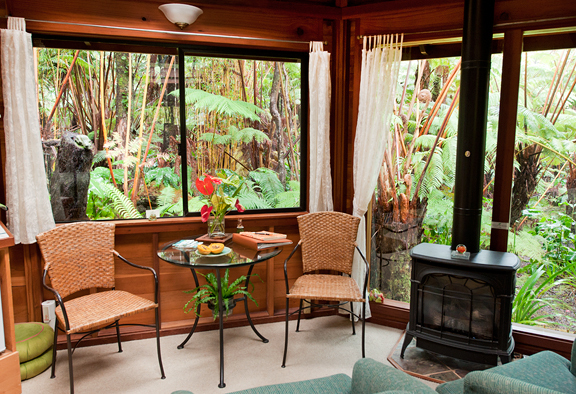 Our 300 square foot space had skylights, big windows, a gas fireplace/stove/heater (it was in the 50s and 60s), an air purifier (you’re RIGHT NEXT to active Kilauea Volcano), refrigerator, wifi, television, robes, flip flops, flashlights, umbrellas, and tons of information on the park and nearby services in the town of Volcano (massage therapists and restaurants). Breakfast is provided the day before: papaya, apple bananas, local pastries, 100% Kona coffee, hard boiled eggs, juice. It’s a crunchy-granola type of place, which we like. There are bins for compost, recyclables, trash. There is a purifier spigot for drinking water which, like all the rest, is sourced from the rainwater they catch. It is quiet, peaceful, relaxing, and private. My only gripe was the lack of shampoo/conditioner. The Hawai’i Volcanoes NP visitor center provides the latest information on lava flows and volcanic activity (close at 5pm). There was no active lava flowing and there hadn’t been for three years. 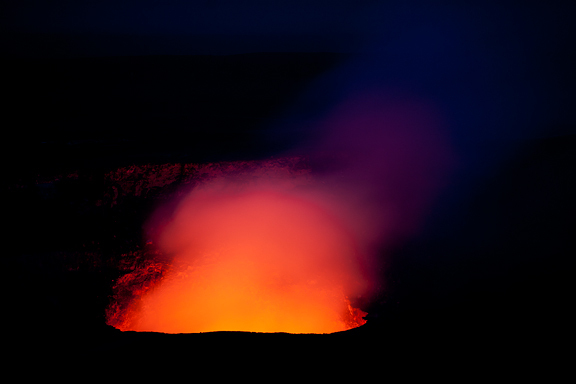 The only activity was at Halema’uma’u Crater and a little at Pu’u O’o – craters housing small lava lakes that weren’t doing much at the time. The volcanic activity was producing dangerous sulphur dioxide gas which forced closures over half of Crater Rim Drive. 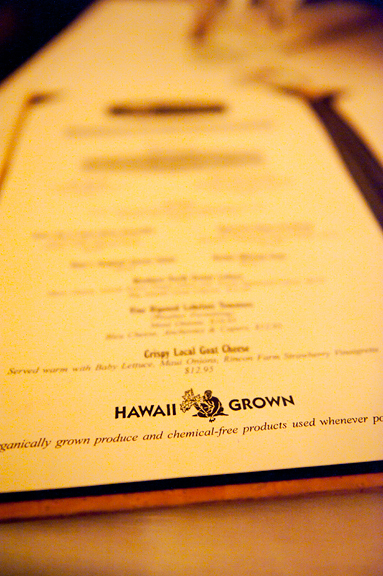 We grabbed a quick dinner at Lava Rock Café in Volcano (the town) even though Kiawe Kitchen‘s menu looked better – we were short on time. While nothing spectacular, the food is decent and you can get some local flavor like liliko’i (passion fruit) vinaigrette on your green salad, fresh mahi mahi fish and chips, and decent kalbi (korean bbq beef short ribs). Reaching the Jaggar Museum in the national park by sunset, we walked out onto the back deck with hordes of middle schoolers and their chaperons in the drizzle and rain to watch steam rising from Halema’uma’u Crater. 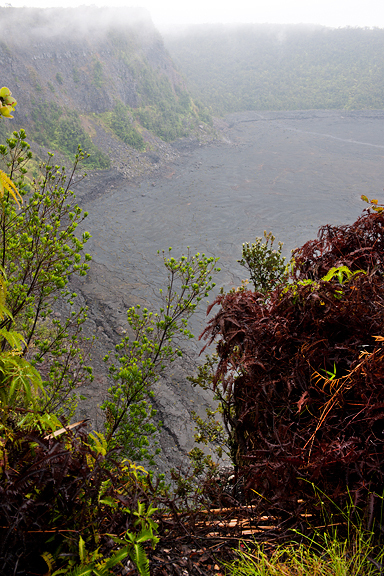 The lava levels were low and deep in the crater, so not visible from where we stood. 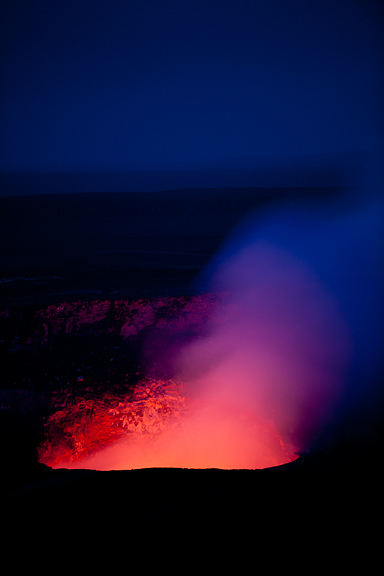 As twilight approached, a faint pink tint appeared at the base of the steam and it intensified to a moderate glow. It was in the lower 50s, but standing around in the wind and rain made it feel colder. 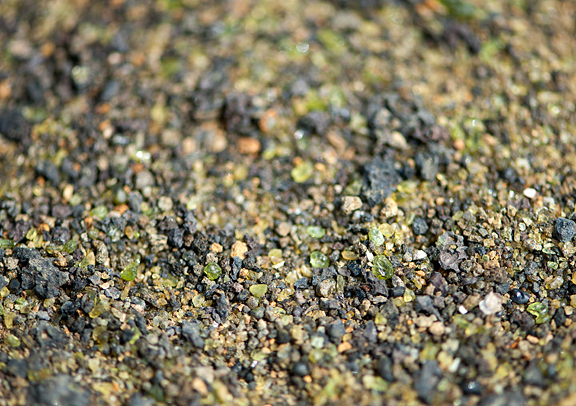 Olivine sand at the green sand beach. Taro malasadas from the Punalu’u Bake Shop in Naalehu. Volcano Rainforest Retreat in Volcano. 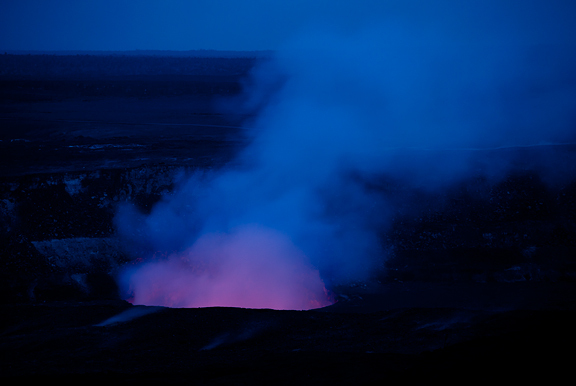 Halema’uma’u Crater at night in Hawai’i Volcanoes National Park. 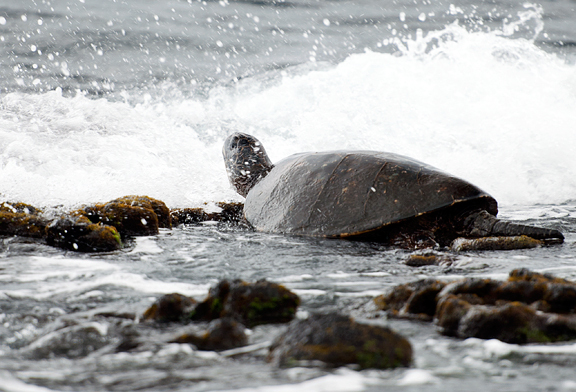 Day 2: We returned to Punalu’u black sand beach in the morning to see what we could of the green sea turtles (honu in Hawai’ian). 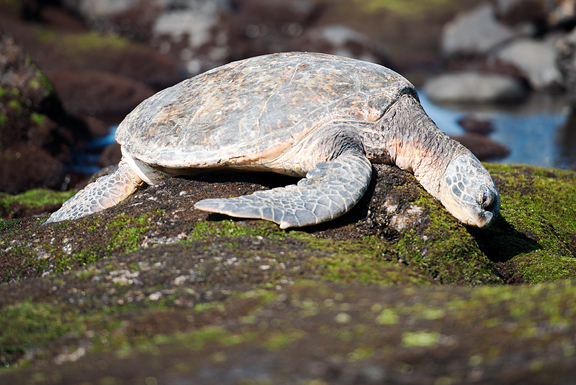 The winds had diminished considerably from the previous day, the sun was shining, and there were many sea turtles lounging about on the beach, the rocks, and flopping in from the surf. On our way to the Puna region (the southeast nub of the island), we visited the Hilo Coffee Mill. Jeremy tasted a few of the coffees and grabbed a caffeinated beverage while I learned about the cherry to bean process at the roasting room next door. Verdict: good coffee and great mini tutorial on processing coffee beans. We also thoroughly enjoyed being stalked by the chickens in the front gardens. 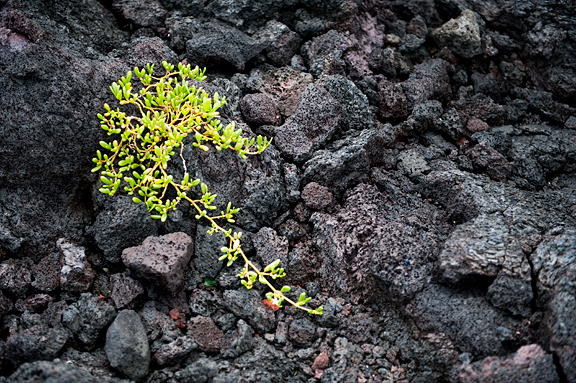 Turning off on Highway 130, we went to check out Lava Tree State Monument (free). It was officially CLOSED when we pulled into the parking lot and there was quite a bit of construction. We approached the entrance to the path and one of the workmen waved us on, “Go ahead in, you can walk around. If anyone asks me I’ll just say I never saw you.” Did I mention how friendly people are on the big island? 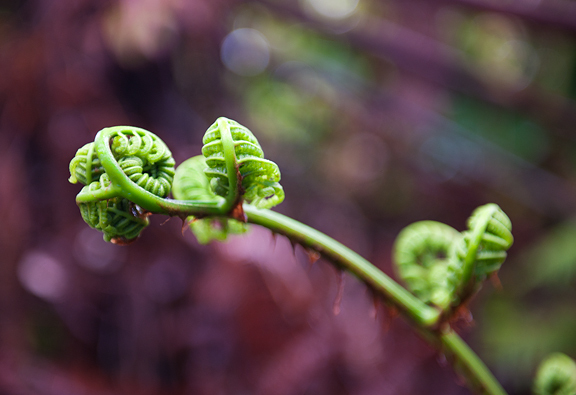 The forest is filled with enormous trees, ferns, vines – everything is growing. 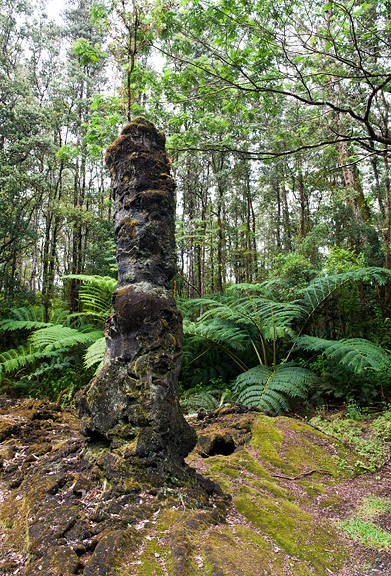 The lava trees are tree molds, formed when lava from erupting Kilauea (1790) flowed up to ten feet deep, engulfing trees. 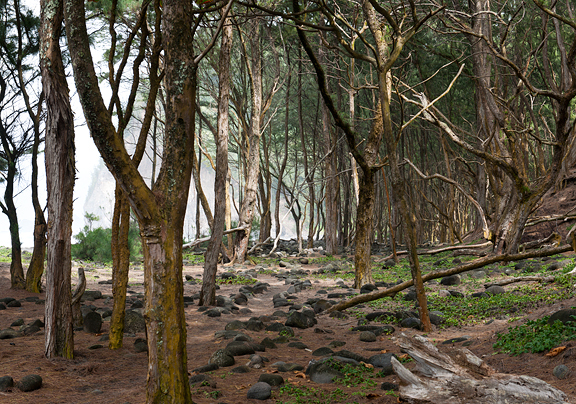 The lava receded leaving hardened rock encasing the trees (which obviously burned away). It is a lovely 1/2 mile walk through the forest. With the improvements (new viewing areas, walkways, steps, displays) it will be impressive when the construction is complete. We walked through rather quickly so as not to get in anyone’s way. Back in Pahoa, it began to rain heavily. 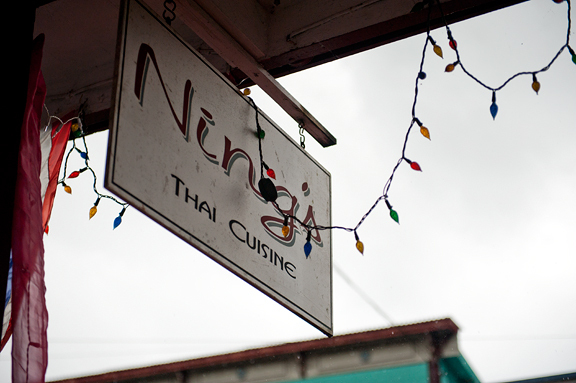 We dove into Ning’s Thai Cuisine for lunch. I don’t know what it is with the authors of Lonely Planet: Hawai’i the Big Island, but they have questionable judgment when it comes to recommending Thai food. [Note: We had Thai food at three different Thai restaurants on the big island for our 2005 trip and they were all disappointing.] 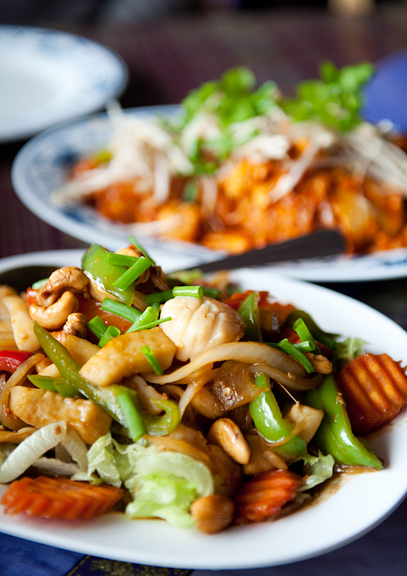 It was passable for food, but honestly – I can make much better Thai food and I’m Chinese. 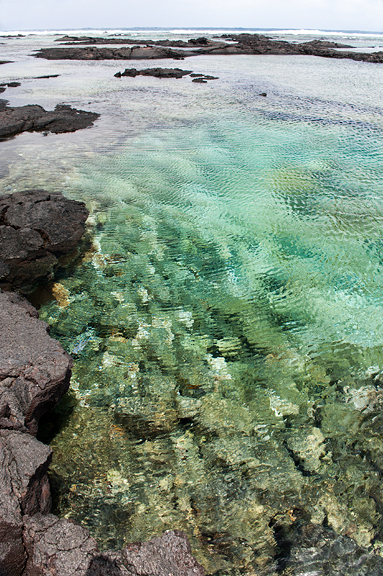 At the coast past the town of Kapoho you will find the Kapoho Tidepools (suggested parking donation fee $3). 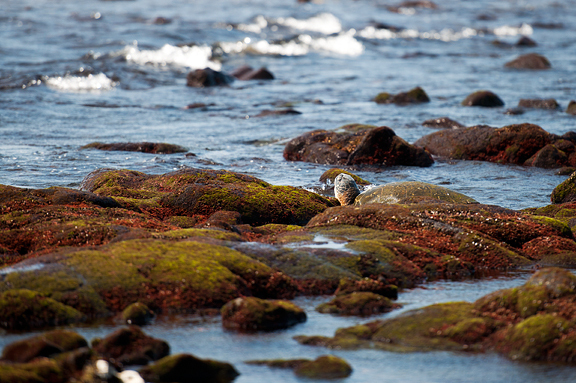 It’s a large expanse of lava rocks cradling shallow tide pools teeming with wildlife. The water is crystal clear aqua blue and bright colored fish light up the pools as they scoot along. There is good snorkeling here, but we weren’t equipped for it. It was another windy day, which made seeing the underwater critters difficult due to the disruption of the water’s surface. On our return to Volcano, we stopped at Kea’au (where Highways 11 and 130 merge) to look around their markets for groceries. 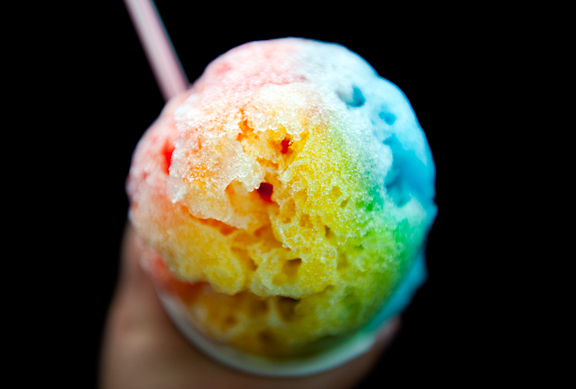 I grabbed a shave ice from a stall at the market – li hing mui flavor (salted dried plum). Too much syrup. Gah! 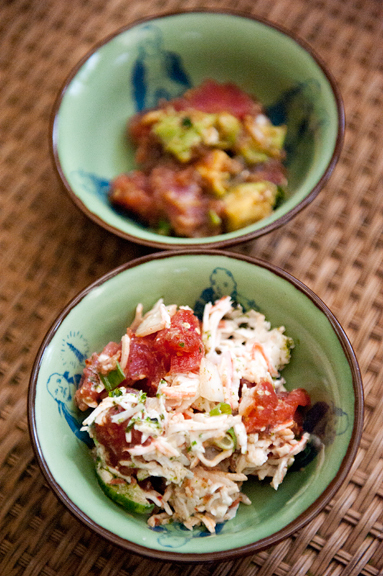 We then wandered over to Foodland (another local grocery chain) and purchased a couple kinds of ahi tuna poke and green salad to round out our leftovers back at the bed and breakfast. 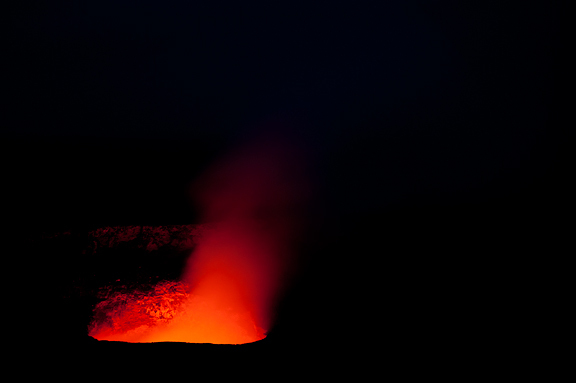 It was pouring rain back in Volcano, so we opted out of a night shoot at the crater. 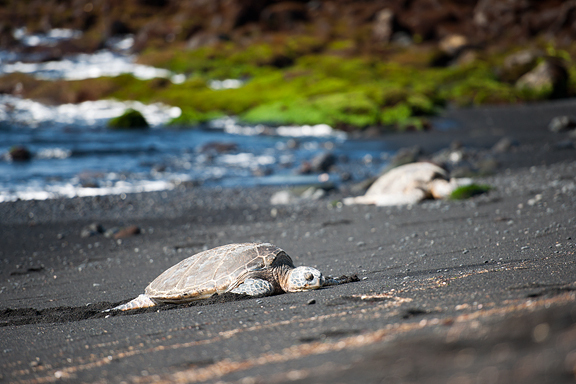 The green sea turtles at Punalu’u black sand beach. Good coffee at the Hilo Coffee Mill. Ahi tuna poke from Foodland in Kea’au. Day 3: Jeremy thoroughly enjoyed his 100% Kona coffee at the bed and breakfast (it was Kona Shark’s 100% “Killer” Kona Estate) before we packed our things and returned to Hawai’i Volcanoes National Park for a short hike along the upper portion of the Kilauea Iki trail. I wanted to check out the plants and see what views were to be had (not many – it was raining and foggy). Sadly, the ginger were not in bloom like they were back in February. The further we hiked the harder it rained, so we turned around and hiked back to the parking lot. Driving east along Highway 11, just past Volcano are the Akatsuka Orchid Gardens (free) which are less like gardens and more like a nursery. 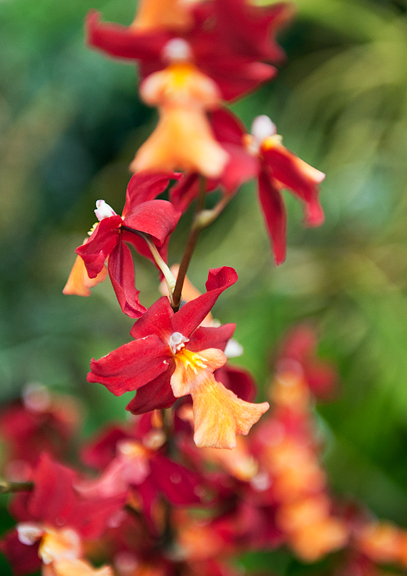 Tours come through here regularly, so I was not at all out of place photographing the different varieties of orchids. Nor was I out of place when I went hunting for gifts at the adjacent gift shop. 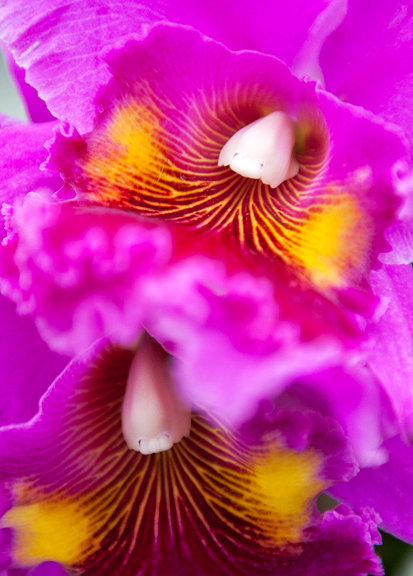 It’s worthwhile to see if you like orchids (which I do). Free blossoms and bobby pins in a basket at the entrance for the ladies. Next up – Hilo! The first stop was Lili’Uokalani Park (free) along Banyan Drive. We walked out over the bridge to Coconut Island Park mainly because I have a fascination with small landforms and Jeremy loves noodling about on the tidal pools. 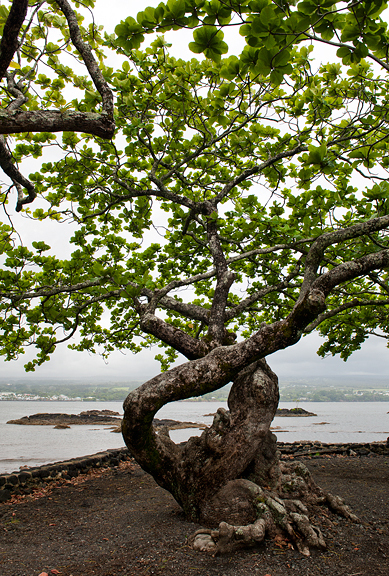 It’s a pleasant little park with a view of Hilo Bay. Our hotel, Uncle Billy’s Hilo Bay Hotel ($83/night for 2 double beds, online booking) which was the jankiest place we stayed the entire trip, was just up the road from Coconut Island. The common areas are fine, but the room was tired and the bed nearest the air conditioner had an enormous crater in the center that sucked you in like a black hole. Thankfully, the other double bed had seen far less use. The best part of the stay? Reliable wifi. On to lunch at Hilo Bay Café. Wow. 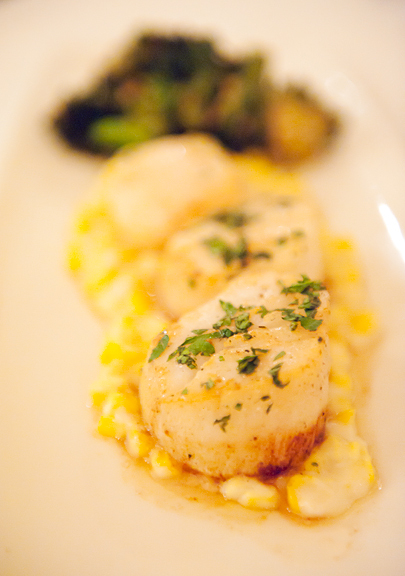 This meal knocked our socks off. 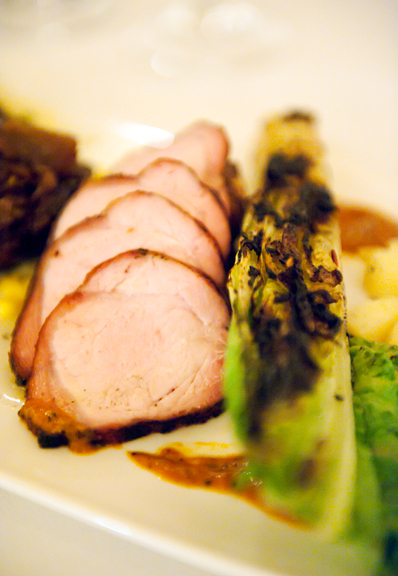 The food was fresh, local, creative, and phenomenally good. I had a hard time choosing what to order because it all appealed to me. I’d rank it the second best meal we had on the trip. Service was excellent and I especially liked the comfy arm chairs we sat in. It’s popular with the locals, and that’s a good sign. 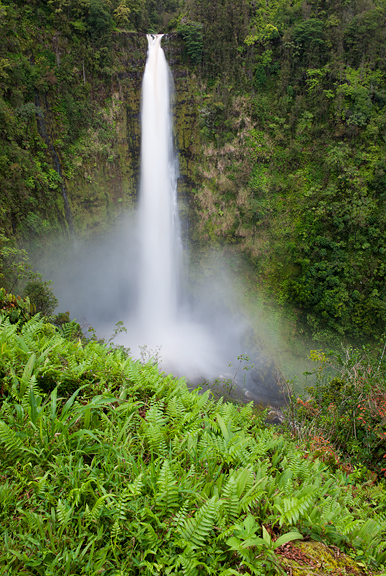 We ventured up to Akaka Falls State Park (parking $5 in lot or park for free along the road but then pay $1/person to enter) to scope out shooting the next morning. Good thing we did because a sign said the park opened at 8 am (I was planning to get there at 6 am). Akaka falls was a delicate stream of water the last time we visited, but because of all the rain (yes, it was raining) there was a muddy torrential flow raging instead. It still looked amazing as did the rest of the trail. Just as we reached the car, one of those crazy downpours drenched EVERYONE in the vicinity. Driving back into Hilo, we sought out Itsu’s Fishing Supplies. 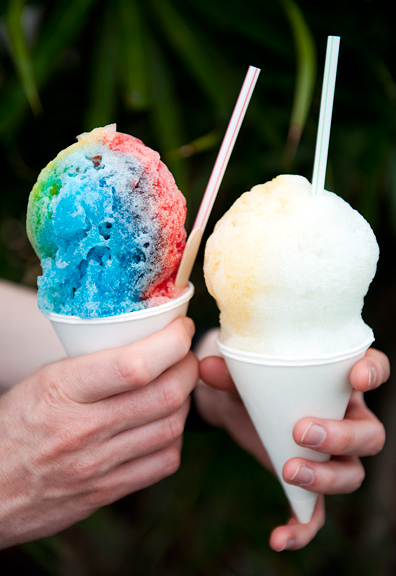 We weren’t looking for bait or tackle, we wanted their famed shave ice as in, the best shave ice. They also serve lunches. Come for the shave ice after 2pm (I think because she’s busy with the lunch rush). We ordered the rainbow (despite the artificial colors, you kinda have to) which is strawberry, pineapple, and blue vanilla, and a lychee/liliko’i. I like the way she packs the ice into a ball on the cone. Also, they add just the right amount of syrup without making it disgustingly sweet (it’s damn sweet as it is). It’s perfect. There was one more requisite food stop before we could call it a day: Two Ladies Kitchen, also in downtown Hilo. It’s a tiny tiny storefront with room enough for the register at the counter and a half dozen patrons. There was a constant line of people coming in to order the delectable mochi creations. Through the door you could see the large kitchen where the mochi were being formed and packaged for orders. It’s the kind of place where you walk in and they (meaning the employees and the customers) expect you to know what you want, order, pay, and get out of the way for the next guy. I ordered a small assortment and then added two strawberry mochi which seemed to be a special. I had no idea what they were. Everyone who came in to order after me essentially ordered ONLY the strawberry mochi – some as much as 2 dozen. I know why. After tasting the strawberry mochi (a fresh strawberry with sweet azuki beans, wrapped in silky white mochi) we were in heaven. The other mochi were also good, but the strawberry mochi – outta this world amazing. On our way back to the hotel, we swung by Suisan’s Fish Market out of curiosity. Oh man… all of that fresh fish! Incredible. 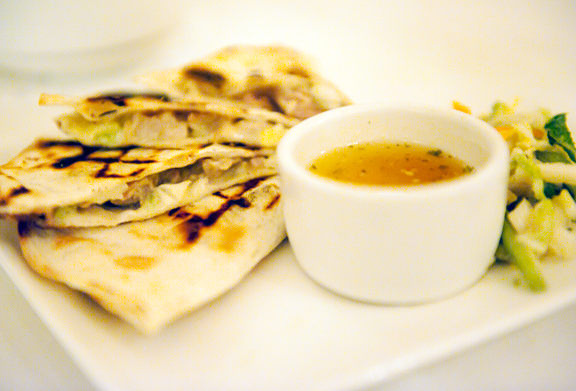 That evening we had a late dinner (late is relative – a lot of places are empty by 9 pm) at The Seaside Restaurant. It was a Friday night and they were super busy. We had a reservation, but it still took 15 minutes to get seated. The menu is a mix of some sushi, sashimi, seafood, and land critters. Our appetizer (spider roll) arrived in a timely manner as did our soups, but then we waited nearly an hour before our entrées arrived. I’m not sure if there was a screw up, but I was practically falling asleep. This restaurant is referred to as no frills, which is accurate. 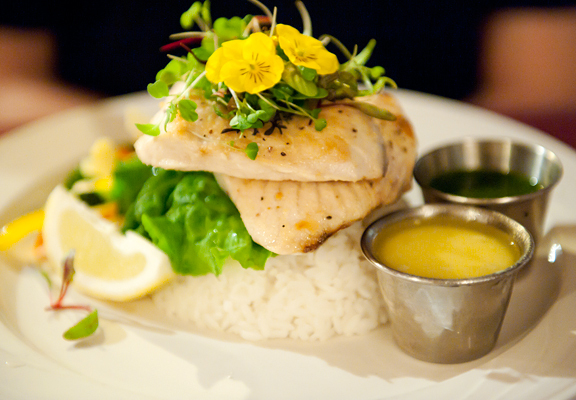 The food is solid fare and the fish is fresh, but it’s nothing special and most certainly too much food. 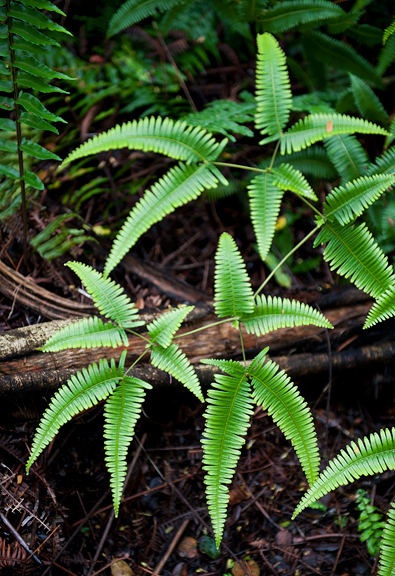 Kilauea Iki trail in Hawai’i Volcanoes National Park. Lunch at Hilo Bay Café in Hilo. Akaka Falls State Park north of Hilo. Shave ice from Itsu’s Fishing Supplies in Hilo. 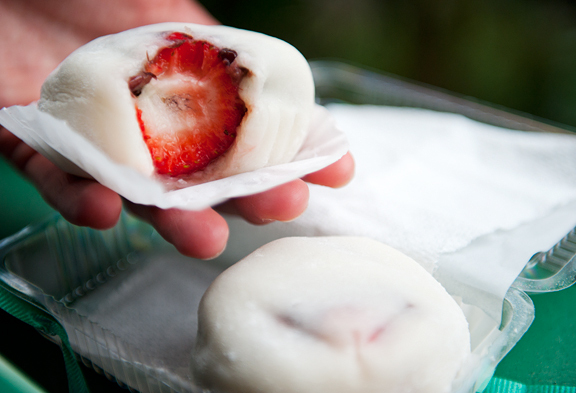 Amazing strawberry mochi from Two Ladies Kitchen in Hilo. 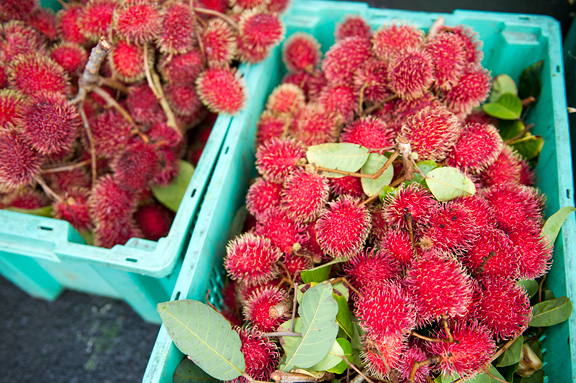 Day 4: Saturday morning in Hilo means the Hilo Farmers Market. 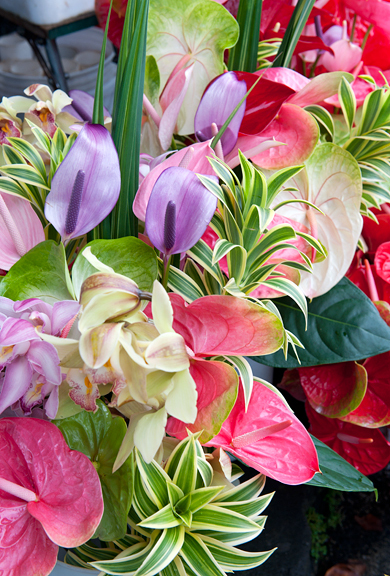 It was raining (again), but under the tents were piles of tropical fruits, vegetables, flowers, honey, coffee, seafood, Asian vegetables, prepared foods, jams and butters. 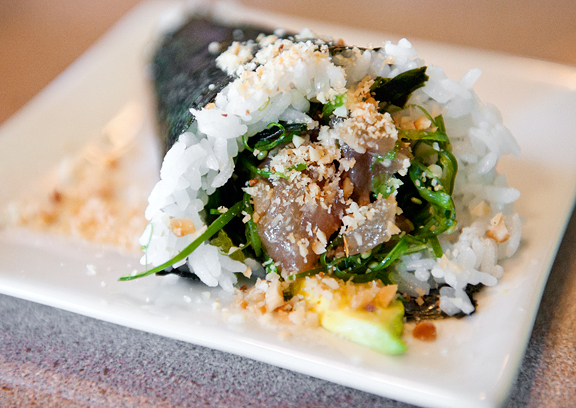 Talk about ono local grindz! It’s beautiful to see, incredible to taste (they offer lots of tastes). 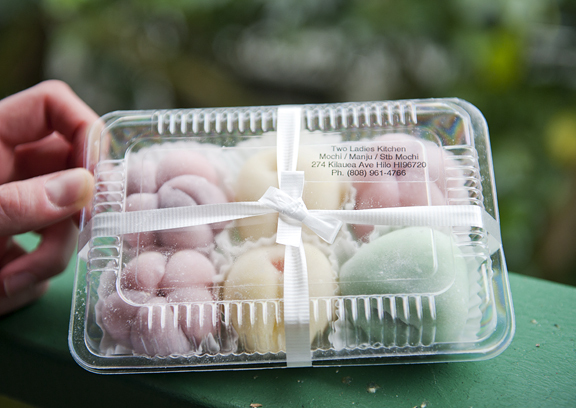 We came away with mangosteens, lychee, liliko’i bar (like a lemon bar, but passion fruit) and liliko’i mochi. I ordered a half dozen jars of jam to be shipped home from one woman**, and then we purchased a few pounds of the Kona Shark’s 100% “Killer” Kona Estate whole bean coffee. Then I dragged Jeremy around the crafts tents for an hour looking through the jewelry, paintings, textiles, and glassworks for gifts. 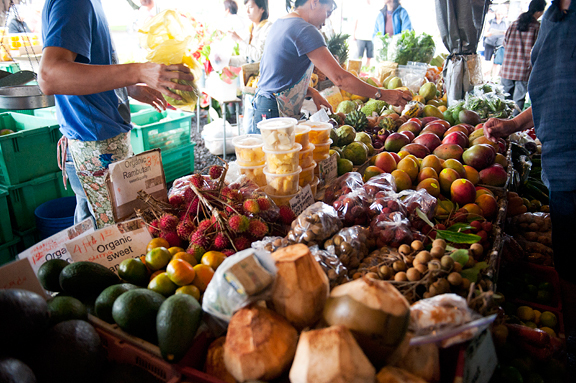 The farmers market makes me want to live in Hilo. **Bad merchant update: So I waited a month for my shipment of liliko’i jams to arrive, but they never showed up. I went back to my receipt from the Honomu Jams and found their phone number. I called and left a message inquiring about my shipment. I never heard back from them. Eventually, I had to request that my credit card company cancel the payment. That was sad. Before leaving Hilo, we made one more stop at Rainbow Falls just west of downtown. I’m not a huge fan of the falls there, but the reason we went was because Jeremy LOVES the banyan tree at the park. It’s enormous and impressive. We ventured north from Hilo along the green and cliffy Hamakua Coast (a beautiful drive/place) to Honoka’a. For some reason, every time we come to Honoka’a it is sunny. It could be raining just ten minutes away in either direction (east or west) and yet the clouds give way at Honoka’a and a cooling breeze blows in from the ocean. 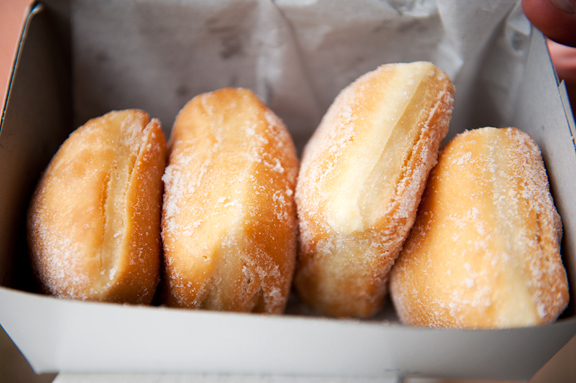 The big attraction is Tex Drive In, famed for their malasadas. 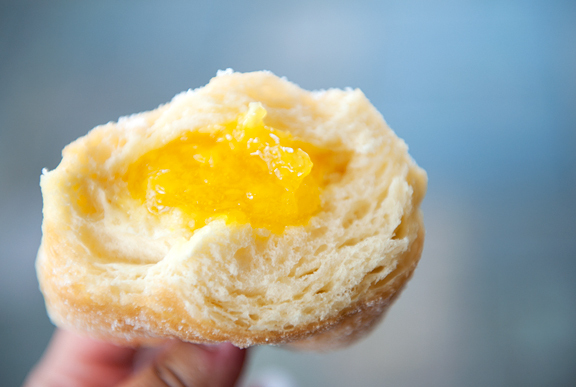 They really are the best malasadas – plain or filled (lots of options). Tex also serves a wide array of food (walk up and order): fruit smoothies, milk shakes, coffee, sodas, pizzas, burgers, curry on rice, saimin, wonton bowl, just about anything with gravy. 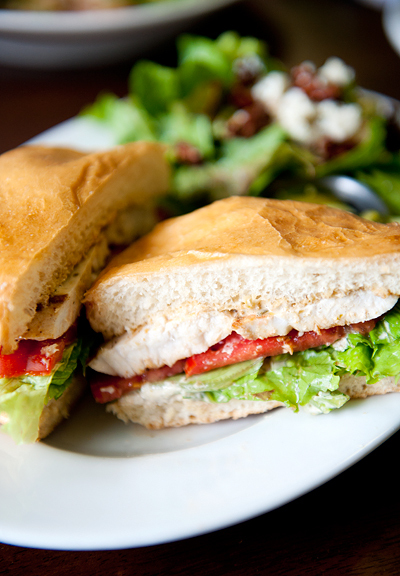 It’s good local fare – nothing fancy, but it really hits the spot. Also good enough to take moms on Mother’s Day (we saw a few families). The hot malasadas are so good we came here twice on this trip. So there is a road on Google Maps called Mud Lane that leads from the Waimea Country Club to Waipio Road. We took it. It starts out nicely paved and lined with tall, gorgeous trees. Then it eventually becomes dirt. Then it becomes dirt, rock, overgrown, rutted, and steep. It would probably be fine if we didn’t have a rental car with 2 inches of clearance (okay, 3). We bailed at Haul Cane Road which is thankfully paved because a nice fellow informed us that “it just gets worse!” near the intersection. 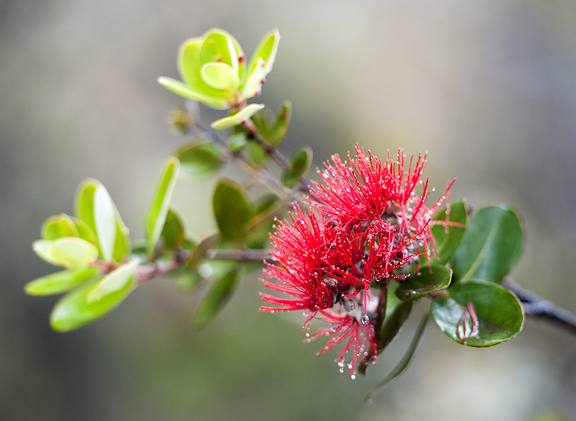 It’s pretty, but it’s muuuuch faster to take 240 (Waipio Rd.). We popped out onto 240 and went to scope out the Waipi’o Valley Overlook (free) before driving to Waimea (Kamuela) – my favorite town on the big island (Hilo is a close second). 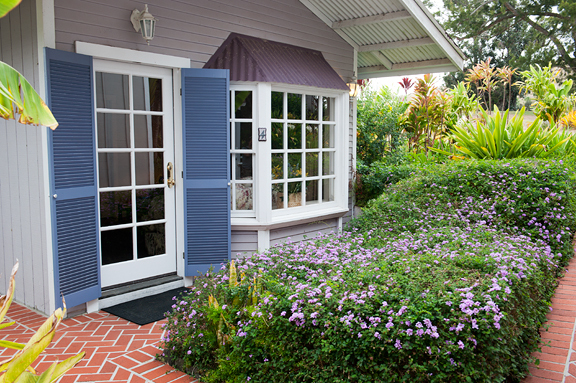 We checked into the Jacaranda Inn on the dry side of town. Yes, there is a wet and a dry side of town (the town is on the saddle between two mountains). 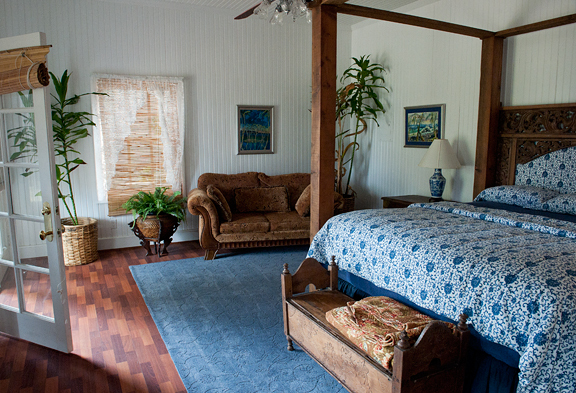 I had booked the White Lily Room ($199/night) for two nights. It is a spacious stand-alone room with cavernous bathroom including a whirlpool tub and shower stall larger than my walk-in closet. King bed, coffee (which Jeremy says was terrible), television, private deck to enjoy the breeze at 2500 feet above sea level, ceiling fans, and two doorways to let in the fresh air. No wifi except in the main house (which is a little creepy because it’s totally empty). 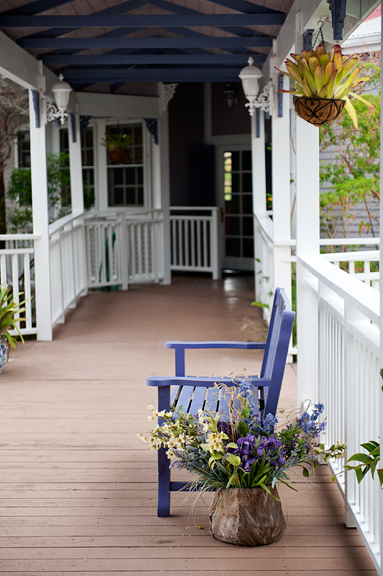 The grounds are lovely although the exteriors could use a good sanding and repainting. While everything looks nice, I couldn’t help but feel that upon closer inspection the place was a little neglected. And a few dead cockroaches in the morning meant they probably sprayed the perimeter with poison. 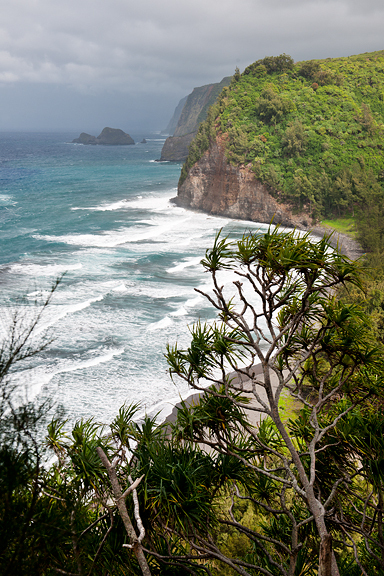 After unloading our bags, we drove down to the Pololu Valley Overlook (free) to scope out conditions. It was crazy windy and about to storm, so we opted to revisit the next day and returned to Waimea for a gander at the KTA grocery store in town. This one is really well stocked and large! We had just enough time to wash up and pop over to Merriman’s. 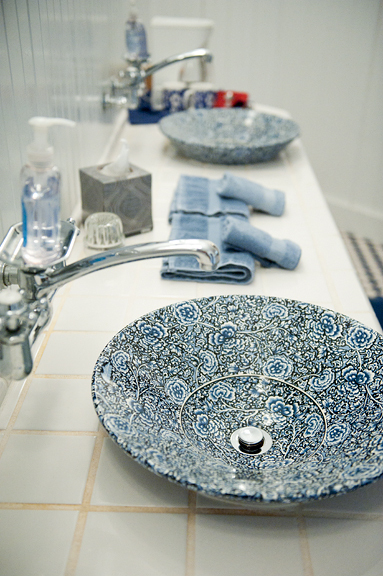 Merriman’s came highly recommended from several people and with good reason. 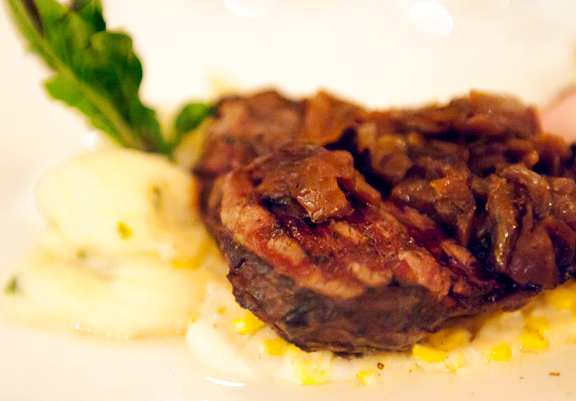 The food, wine, service – knocked our socks off! The menu lists one tempting plate after another. 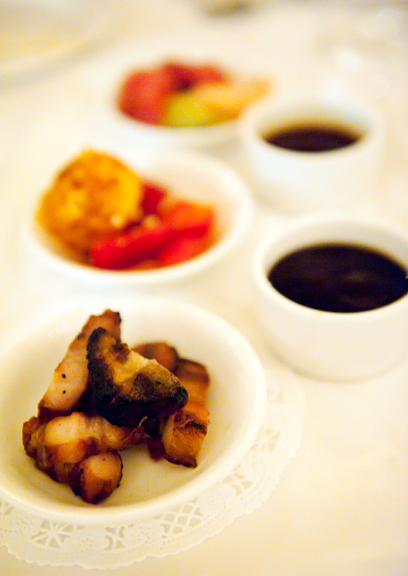 If you can’t decide there is an appetizer sampler. This worried me. Appetizer samplers smack of Applebees and I didn’t come to the Big Island for Applebees. We were assured that the portions were intended for two people and that it wouldn’t be too much food. It was phenomenal: crispy local goat cheese on macerated strawberries, spicy tomato clams and shrimp, ahi sashimi, kalua pig and sweet onion quesadilla, and house cured bacon accompanied by a heady Kona coffee glaze. Similarly, we had this dilemma with ordering mains because they all sounded so appealing. They do offer a half and half option where you can order two mains and get half portions of both (except for things like bone-in steak). We ordered the diver scallops and then did a half and half with the petit filet mignon and the pork tenderloin. AWESOME! 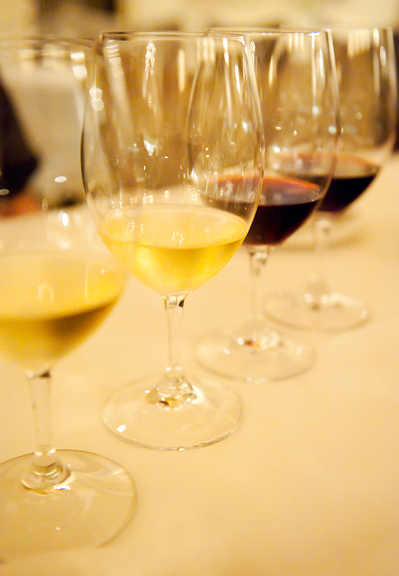 I might also mention that the wines were exceptional by themselves and out of this world when paired with the food (the flight comes with a sheet of descriptions and suggested pairings). This was far and away the best meal of the trip. Go to Merriman’s. 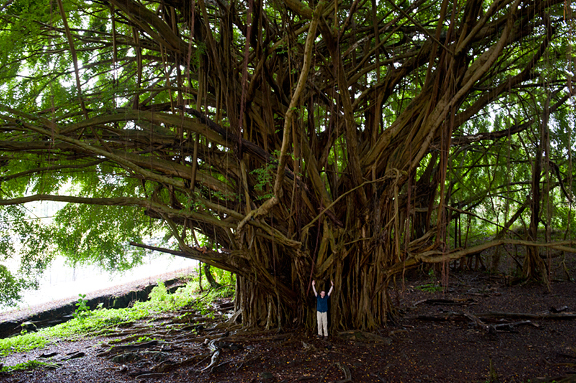 The giant banyan tree at Rainbow Falls in Hilo. 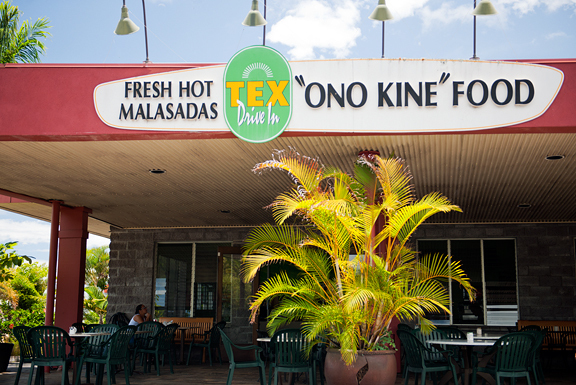 Fresh hot malasadas at Tex’s in Honoka’a. KTA grocery store in Waimea (Kamuela). Day 5: Having experienced rainy weather for most of our trip (even the folks in Volcano were complaining and they live in a rainforest! ), we were surprised by a lovely rain-free, partly sunny day. I love Waimea because the air is drier and cooler. We skidaddled back to the Waipi’o Valley Overlook to hike down into the valley. They only allow 30 minute parking at the lot, but people planning to hike down park along the side of the road leading to the overlook. The road leading to the valley is paved, but insanely steep. It drops about a thousand feet in less than a half mile. That’s the lure of this amazing valley – it’s soooo steep and enticing! Only 4WD vehicles are allowed on the road (no AWD allowed). The pavement ends at a dirt (or mud) road that runs parallel to the valley. We took it south to get a gander at some of the falls around the corner and then turned back north toward the black sand beach. The hike out was hot (for some reason the breeze that caressed us on the way down disappeared on the way up) and steep, but thankfully this time there weren’t any mosquitoes. On the way back to Waimea, we picked up something cold to drink from Tex’s. I got a passion fruit smoothie and Jeremy got a chocolate milk shake. I told Jeremy he could order a chocolate milk shake anywhere, but a passion fruit smoothie? That’s hard to find on the mainland. Awesome sauce. 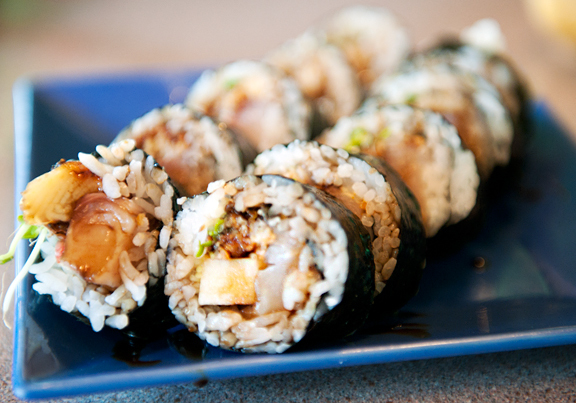 From Honoka’a we drove through Waimea (Kamuela) down to charming Hawi for lunch at Sushi Rock. 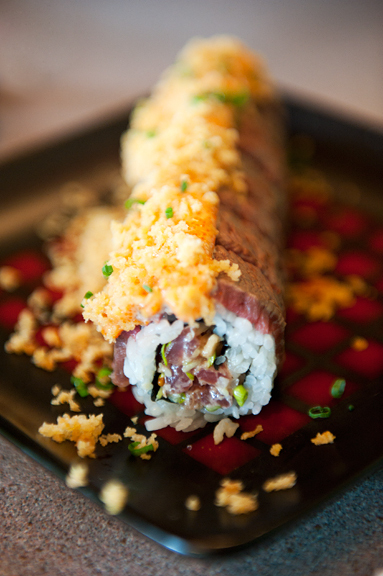 This is creative sushi with local flare and local ingredients. 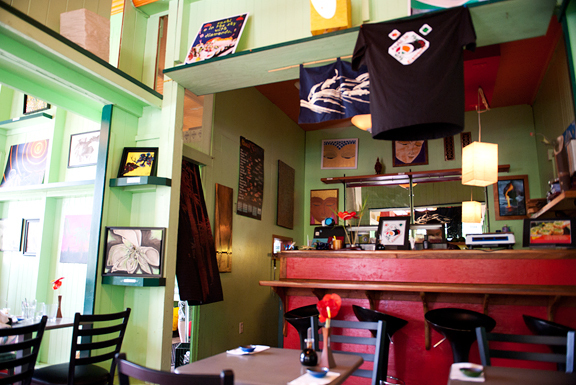 The restaurant is small and sells a lot of handmade crafts and artwork. It wasn’t terribly busy, but then again it was Mother’s Day. We thoroughly enjoyed the rolls we ordered, but I felt like I was going to pop! The plan was to swing by Kenji’s House to see the seashell collection, documentation, and artwork of Kenji Yokoyama. Despite all reports that it is open daily, it wasn’t open on Sunday. Bummer. 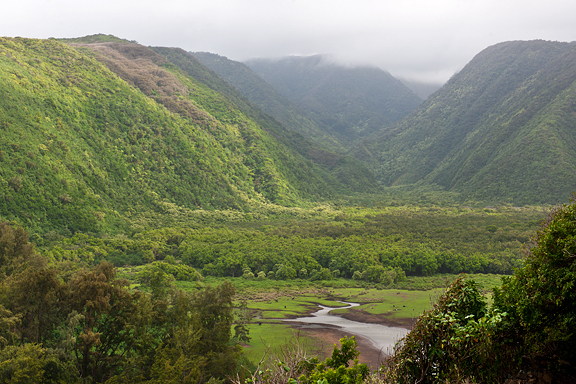 So we continued down the road to the Pololu Valley Overlook and hiked down to the valley. This dirt and rock trail is milder than the Waipi’o Valley road, dropping only 400 feet in about a third of a mile and there are switchbacks. 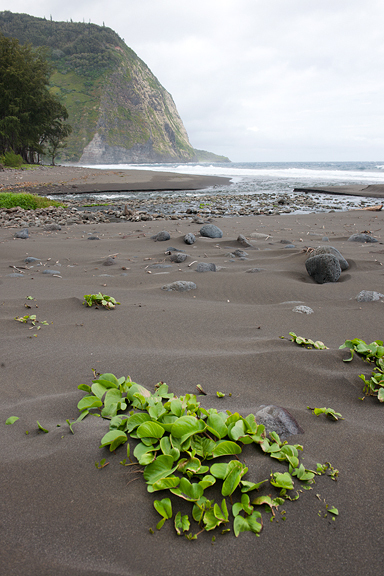 There is a black sand beach at the mouth of the valley and beautiful forests skirting the coast. As weather moved in from the ocean, we could spy a rainbow off shore. Driving back from Pololu Valley, we made a slight detour to Hawi to beverage up at the Kohala Coffee Mill. Jeremy dosed up on his Kona coffee while I went up the stairs to Upstairs at the Mill for a lychee shave ice. Jeremy said his latte was excellent. My shave ice was bright pink. I didn’t like the artificial color, but worse, I didn’t like the artificial flavor. Plagh! And they also added too much syrup (there is a fine balance that only Itsu’s seems to understand). Now I know better. That evening, I made the mistake of hoping that trying just one more Thai restaurant might break the losing streak. Boy, was I so very wrong. We ate at Charley’s Thai Cuisine. I don’t know Charley, but Charley’s Thai food disappointed the hell out of us. We ordered mee krob (they used egg noodles instead of rice vermicelli?!) and the fish special. The vegetables were too salty and clearly “junk” vegetables, the sauce was slathered on as if it had come from a jar (it just may have) and I think it was used on BOTH dishes (WTF? 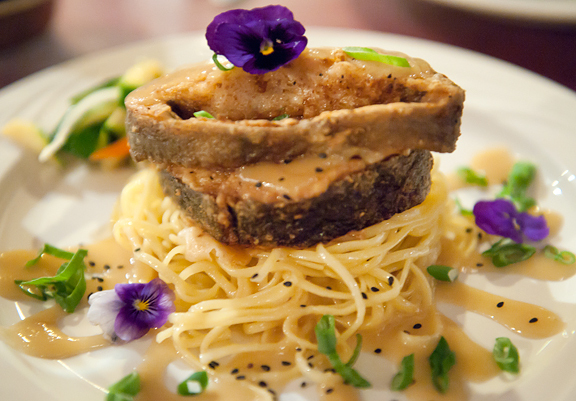 ), and the preparation of the fish was uninspired and an insult to the fish. No more Thai food on the big island for me. Lunch at Sushi Rock in Hawi. Coffee at Kohala Coffee Mill. Day 6: Feeling a little Hawai’id-out, we took a leisurely schedule that morning. 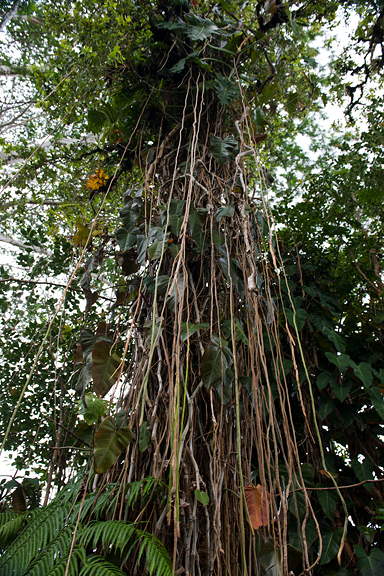 Originally we were planning to leave early and get a tour of the Kona Cloud Forest Sanctuary, but they were booked up. 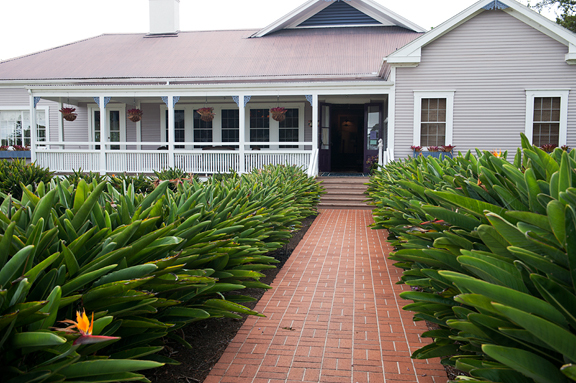 Because the weather in Waimea (Kamuela) is more agreeable to us than the weather in Kona, we hung out on the lanai of the Waimea Coffee Company which offers the array of caffeinated beverages, pastries, salads, and other good-looking noshables. They also offer free wifi. Jeremy sipped his latte and we both worked on our laptops while the rain came down. It was nice and cool. People wore pants! For lunch, we checked out a few places in town and finally decided on Pau in the same plaza as Merriman’s (already a good sign). I’m so happy we had lunch here. Walk up to the counter to place your order. 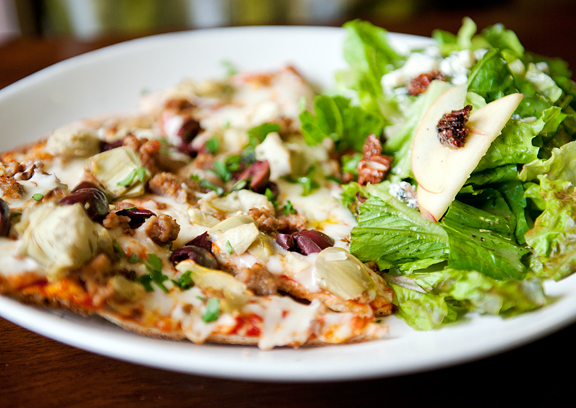 This little café style joint has pizza specials for the day (you can order some by slice), super fresh leafy salads, juicy fish cooked to perfection, and passion fruit iced tea! Our orders came with side salads (greens dressed in light vinaigrette tossed with candied pecans, fuji apple slices, and Gorgonzola), but I didn’t know that when I placed my order, so I had another small salad. No problem. I crave greens when we’re on travel. 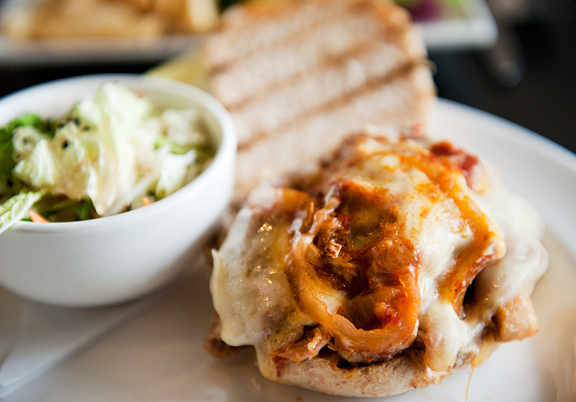 Their food is prepared simply, letting the fresh and quality ingredients speak for themselves. It was finally time to drive to Kona. Our flight was in the evening, so we looked into things to do that wouldn’t make me hot and angry (just being in Kona can make me hot and angry). 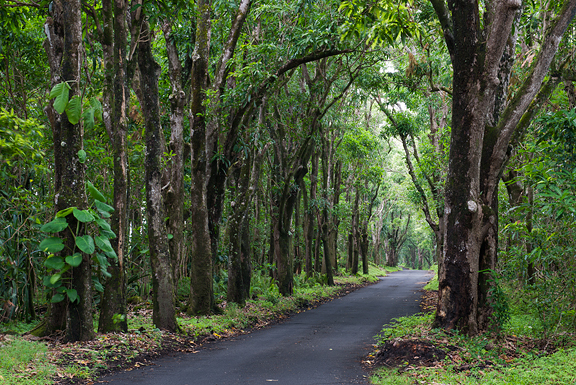 The drive down the slopes from Waimea to Kona is beautiful and impressive. You really have to appreciate the volcanic landforms and the scale of Mauna Kea and Mauna Loa. By the way, if you’re wondering why we didn’t go up to Mauna Kea – we’ve been before and well… Jeremy is a professional astronomer and doesn’t feel the need to live, drink, eat, and breathe astronomy 24/7. I totally get that. I asked Jeremy if there was anything he wanted to do in Kona and he had just one request: to take the Mountain Thunder Coffee Plantation tour (free). Done and done. 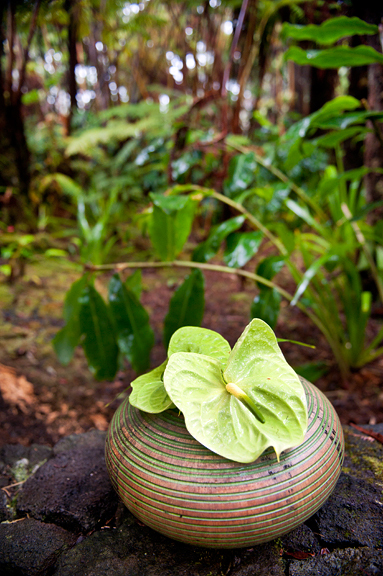 Mountain Thunder Coffee Plantation is located up on the slopes of Hualalai Volcano above Kona at an elevation of about 3000 feet. 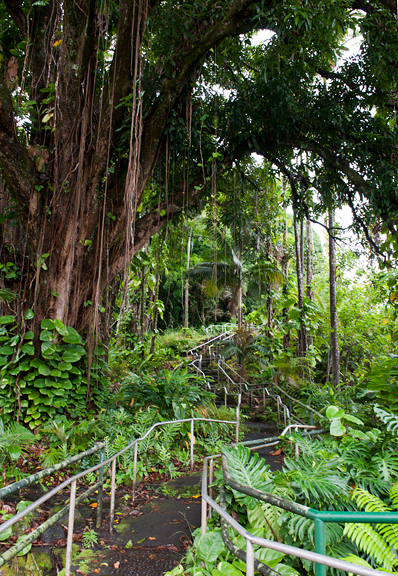 This is also the same area as the Kona Cloud Forest Sanctuary. 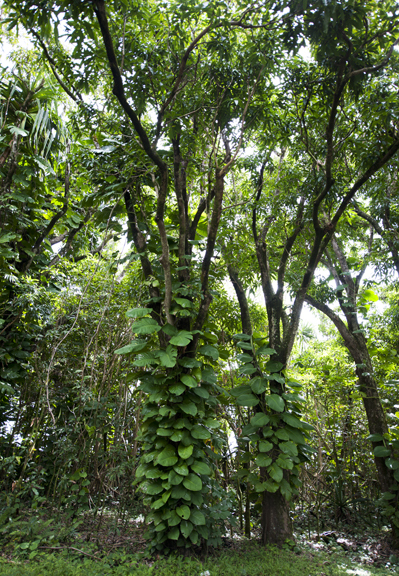 It is lush, jungly, cool, misty, drizzly, and calming (at least for me). The drive up meandered through neighborhoods of large houses (when you could see them) that were mostly set back and obscured from the road. Property is cheaper here than down on the coast. That’s a win-win in my book. The tour was small with seven people in total, but our host probably packed more information into one hour than anyone else in the history of man. 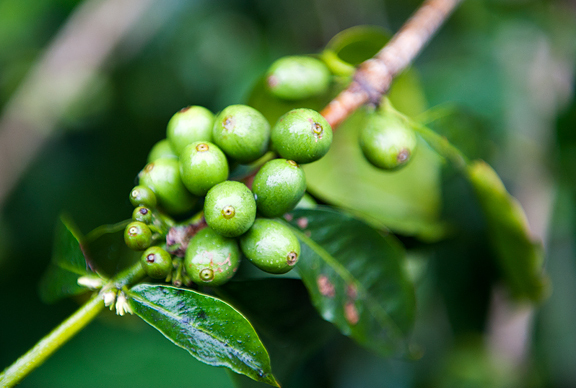 We were told about local plants, local climate, how coffee grows, organic and sustainable farming practices, their selection process, roasting, and their excruciatingly high standards. Mountain Thunder puts quality first – this is clear in their passion, their pride, and their product. They use an infrared detector to identify sub-par beans and remove them. We learned that most coffees claiming 10% Kona on their packages are filling their 10% with rejected Kona beans from other growers. Jeremy tells me (because I don’t drink coffee) that their Award-Winning Organic Cloud Forest Reserve is very different from other coffees. He finds so much complexity and depth of flavor in this coffee that it almost seems like he’s drinking something else. At the end of the tour, we were let loose in their gift shop and seeing how much Jeremy loved the coffee, I bought him some. And then I bought more coffee for gifts to friends. 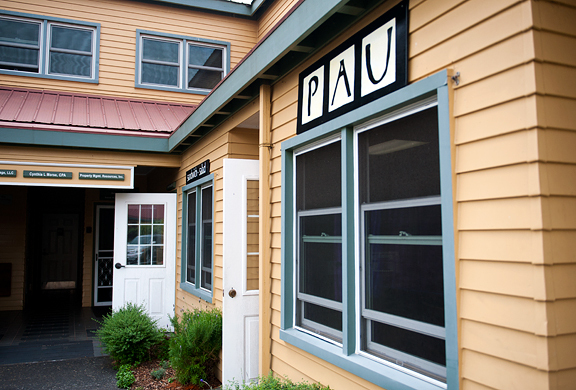 Lunch at Pau in Waimea. The tour at Mountain Thunder Coffee Plantation in Kailua-Kona. Jen, the amount of time you put into this post is awesome and appreciated. Thanks for gracing up with these gorgeous photos and your thoughts and trip memories! Stayed at a condo in Kona for an entire week a few years ago, a good option if you don’t want to switch places and want to be central to everything on the island (plus making our own low-carb breakfasts from Safeway made a huge difference). 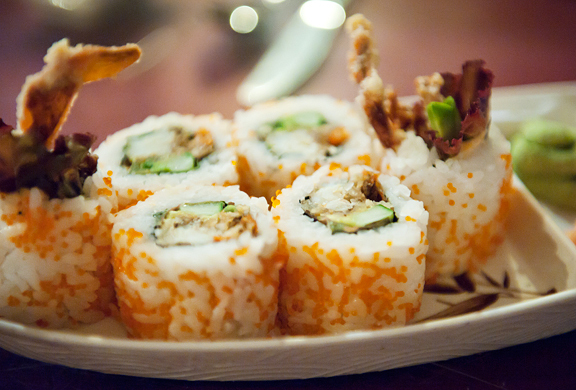 Sushi was ok, Thai was better than most, and we’ve recommended Huggo’s for fine dining after two dinners there. Mostly we traveled around the island from Kona, hitting all the good spots like you did (esp black sand beach/sea turtles, Ka Lae, Pololu Valley lookout – it was too muddy to go down all the way, Waipio Valley lookout, and Akaka Falls) and came back every night to lovely sunsets and ocean waves that helped bring on sleep. 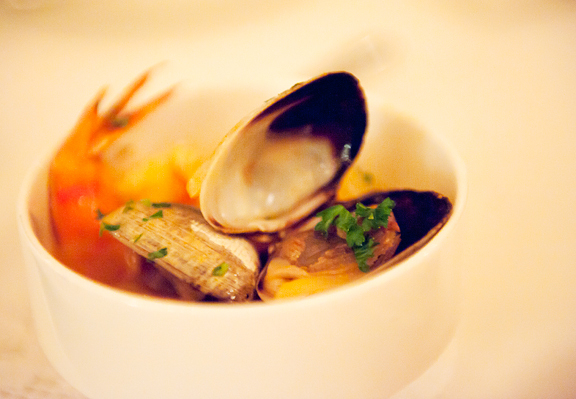 I hear the awesome German restaurant in Waimea is closed now, though! Darnit. Wow. Thanks for the recap, thoughts, and suggestions! I never considered visiting Hawaii, but after reading about what’s there, I may have to take a short vacation there in the future. Thanks again! Wow, i enjoyed reading that. 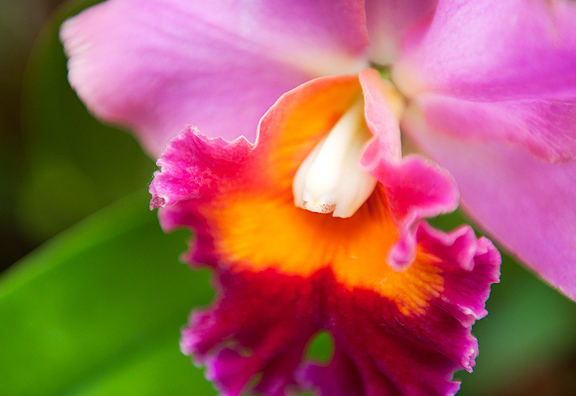 Thank you for sharing your Hawaiian travel tales and stunning photos. I too enjoyed reading about your adventures. Oh…Just beautiful. I have yet to go to the big island myself…I’ve only been to Maui. Beautiful pictures. Makes me want to go! 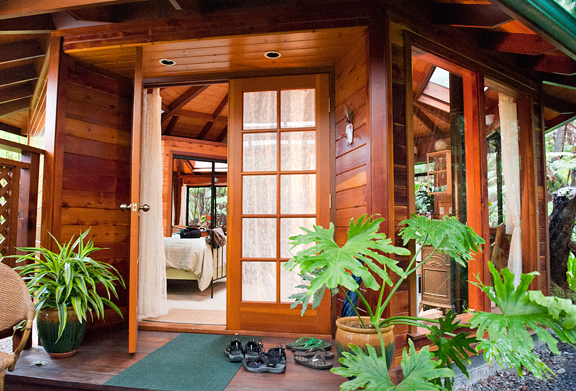 Thank you for sharing this…I’ll have to keep these places in mind for when I do go to the big island. Wow! This must have taken ages. Thank you for sharing in such detail. I wish I could go sooner, rather than later! Thanks for such a thoughtful and thorough recap, Jen! I can’t imagine how much time this took to put together; such an amazing resource! As always, your photos are incredible. Wow!! I just had a free hour and read through the whole thing. Each and every picture is fantastic as well. 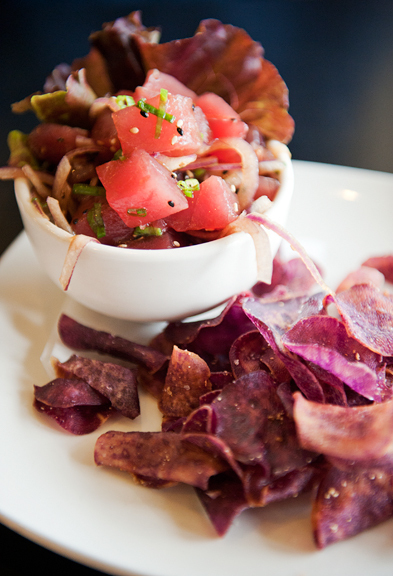 There is nothing I want more now than taro chips, malasadas, and poke…. YUM. My aunt, uncle & cousin live in Hawaii and yet I’ve never been able to make it out. Thanks for the huge write up. 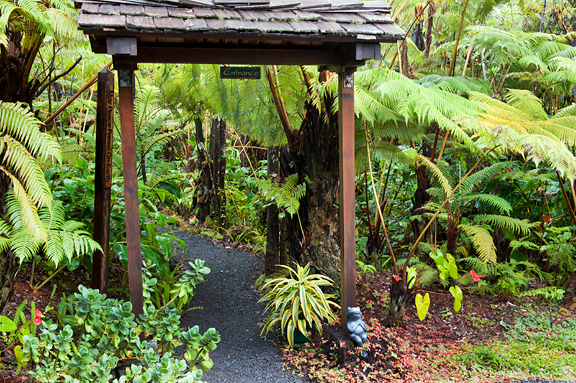 Love this post… my husband is from Hilo and we did almost your EXACT tour last year. 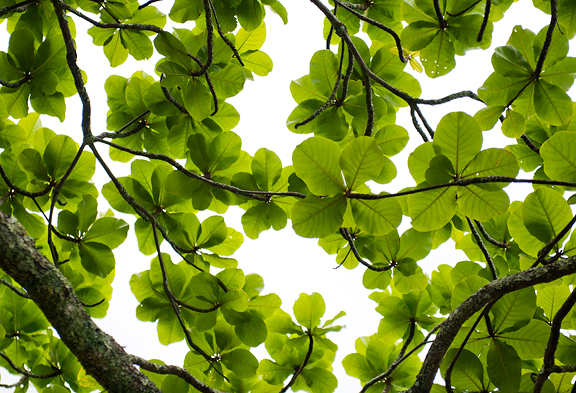 I have to agree about the Jacaranda … the place could be so wonderful but needs some TLC. Now you have me daydreaming about our next trip (at Thanksgiving). :-) Mahalo!! This is exactly the kind of Hawaii trip I hope to take some day! What a beautiful adventure. 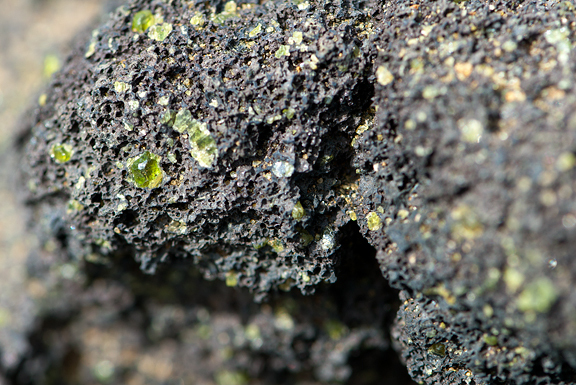 My birthstone is peridot, which I thought was plain and boring until I became a geologist and learned how fascinating olivine is. Loved Hawaii so much that we will go back some day. There is so much to see and do. Great pictures. 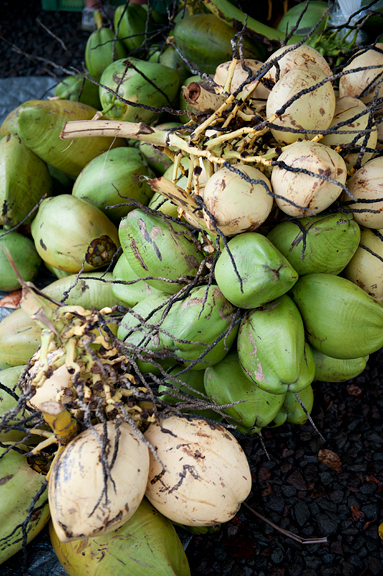 WoW-your post makes me want to go travel to Hawaii right this minute! Your pictures are amazing like always! gorgeous of course! wow, someday I’ll make it there. Beautiful! It’s a nice change from where I live. Thank you for putting so much information into this! Wow, what an incredible post! Thank you, thank you, thank you!!! Thanks so much for sharing, I loved the big island so much, I dream of returning. The weather stopped us trying to see any lava flow or do much hiking or anything on the rainy side of the island, so we’re determined to return asap. We were lucky enough to stay at the kona village resort, and its very sad news that is has closed after the recent tsunami. We had a magical few days there for my husband’s 40th which included watching the turtles on the beach, snorkelling and finally seeing a manta ray come up to wish him a happy birthday under the lights, and a shooting star celebration in the sky. 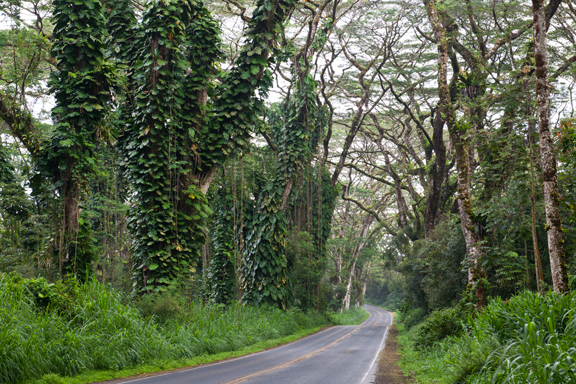 We also loved Puna and Hilo despite the rain that hit us on that side. 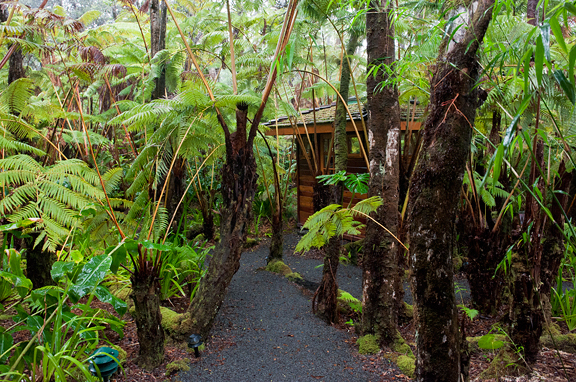 If we ever make it back, I’ll look into the Volcano Rainforest Retreat for sure…. Agree with all…this is a fantastic post! So nice to see places agin not having been there in a while. As with others there’s so many memories. Thanks! Great post! 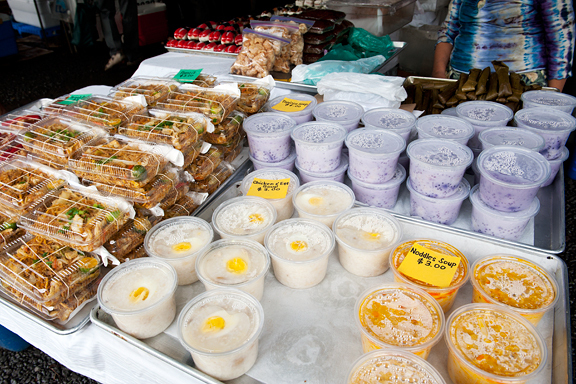 Love the travel info with the emphasis on food…I travel the same way! I realize that this is an old post. 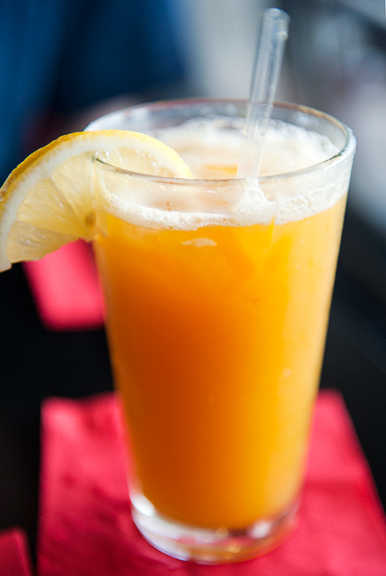 I discovered it today while searching for passion fruit recipes on Pinterest. As it turns out, my family is planning our first BI vacation for this coming September and your fabulous and informative post is sure to be most helpful! Thank you. I have a quick question for you: I’m admiring so many of your beautiful photos. 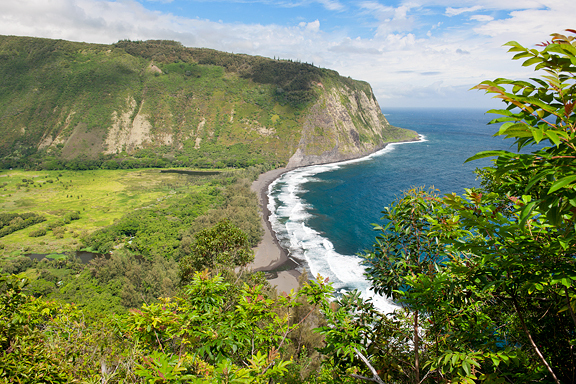 Which lens(es) would you say are a must bring on a vacation to the big island? Thanks so much for your advice! Darcie – It all depends on what kind of things you want to shoot and what your style of photography is. 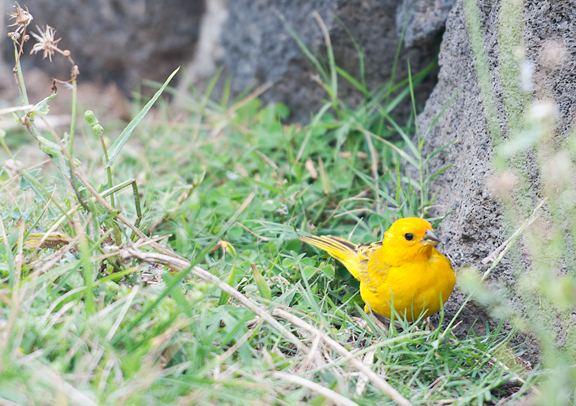 If you want to shoot volcanoes and wildlife, then a telephoto is probably a good bet. If you like big views, then a wide angle might work, although wide angles make everything smaller. I brought my 24-70mm f2.8 and 70-200mm f2.8 lenses with me on my full frame camera. 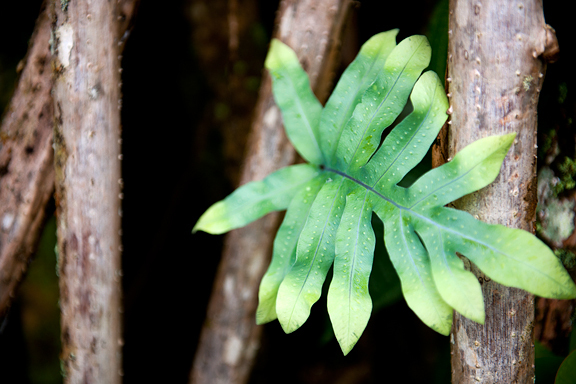 If you have a crop sensor, then there will be a crop factor to multiply the focal length by. 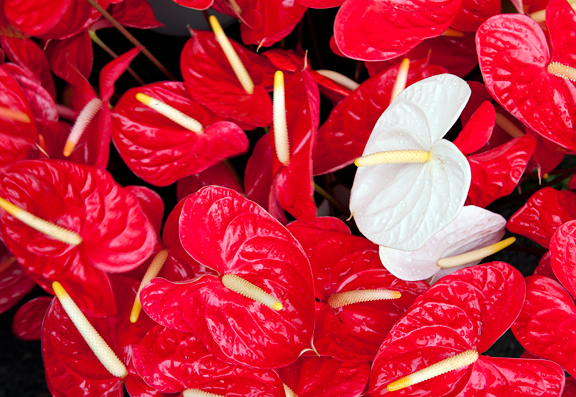 If you want to shoot flowers (soooo many flowers!) 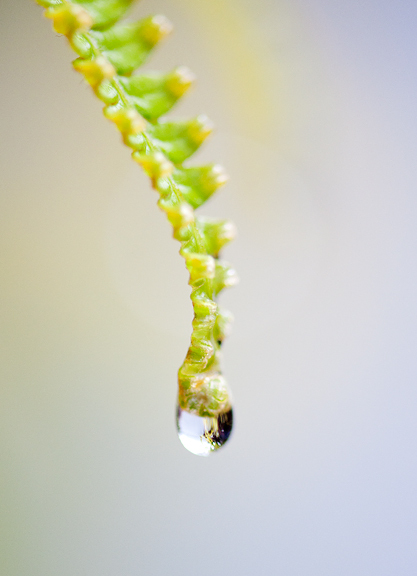 then consider a macro lens. But keep in mind that it will probably rain at some point and that carrying a lot of gear around means you spend more time shooting (or missing a shot because you’re sick of hauling all that weight) instead of vacation. 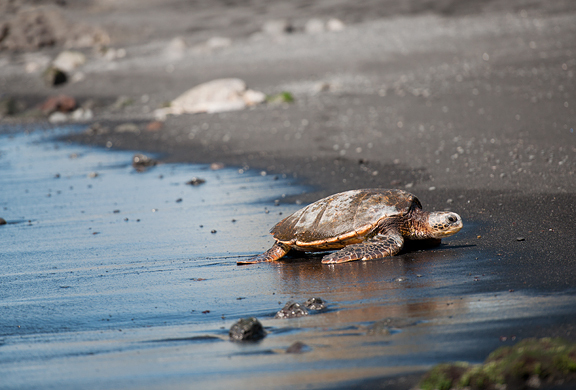 This was a work trip for me – my purpose was to shoot the Big Island. You might get way better photos/memories with a kit lens or even a point-and-shoot camera that has a wide range but without all the bulk and the cost. Have a great time!